Remote control toys are always a favorite with kids and a remote control tractor offers something a little different than your average RC train, car or helicopter! Typically, a remote control tractor comes equipped with movable front loaders and durable wheels perfect for exploring the great outdoors, digging mud and transporting stones and more of nature’s knick-knacks. Not only is a remote control tractor great for exploration and encouraging imaginative play; vital for a child’s development. But they also help to develop good coordination and manual dexterity. There are a wide variety of different tractors available that vary in design, functionality and the age group they are designed for. That’s why it’s important to know just what to look for to secure the perfect tractor for your little one. This remote control tractor is ideal for kids over the age of 3 and comes with an operational front loader for interactive play, as well as lights and sounds for an authentic experience every child will love. In terms of movement, it can be moved right, left, forward and reverse and the front loader can be moved up and down. Its a remote control tractor that is perfect for parents looking for an authentic tractor experience as it really does resemble the real life vehicle, only in miniature form. The accompanying control requires three double AA batteries to operate, which are not rechargeable but should have a considerable run. Thanks to the solid construction and design, this tractor can be used both indoors and for outside play, perfect for every season of the year. Just like the genuine article, this tractor will allow you to dig and load pebbles and stones for true construction experience that your kid is sure to love. This remote control tractor, in particular, is extremely well built and is sure to last a very long time, even with the roughest play. Even though it has a tractor style design, it also functions as a crawler and an excavator, perfect for outdoor adventures, digging and exploring even the most challenging terrains. Instead of the typical wheel design seen on most tractors, this model durable treads on its Caterpillar Track which helps to transport it through grasslands, sand, stones and a wide range of challenging surfaces. It has CR 6 channel function, making the connection strong and stable throughout playtime. Equipped with a front facing dump truck and rear grip hooks mean it’s the perfect toy for digging in the garden at the beach or in the sandbox. This remote control tractor features intricate metal detailing making it look like an authentic life-size tractor. It can also move in all directions and is fitted with LED lights and sound effects for an interactive and engaging playtime. The front arms can also be moved up and down making them perfect for digging sand, gravel and soil. This tractor is designed for kids over 6 years of age and is certainly built to impress the more mature and harder to impress little boy or girl. This Siku tractor is a truly premium toy and an authentic replica of the John Deere tractor. Unlike other popular tractors that feature a yellow construction color scheme, this tractor is green with a shiny finish, which provides a traditional farming feel. In addition, the shell is constructed from die-cast metal for an ultra-realistic effect that is durable, sturdy and contributes to that authentic look and feel of a traditional farming tractor used in agriculture. The front loader is functional and can be moved up and down with the radio controller, making it ideal for digging and transporting loads. While the wheels can be moved both forward and reverse – perfect for indoor or outdoor exploration. Due to the heaviness and high-quality construction, this tractor is designed for kids above 14 years of age and although this is a toy that is sure to provide hours of fun, it is also a superior collector’s item that does need more care than plastic tractors. Although well made, it is metal so do bear in mind that scratching will occur with heavy use and reckless driving. Made from extremely durable alloy, this tractor equipped with a large front shovel loader and large, textured tyres and a four wheel drive means it’s perfect for excavating outdoors. The superior construction means that it will be easily navigated through wet and wild terrains and the strong front loader will easily shovel up rocks, pebbles or any other obstacles that may be in the way. In particular, the four-wheel drive means you won’t have to worry about your little one getting their tractor stuck in the mud or among any difficult terrains they may want to investigate. As it’s fitted with big wheels, it also has a good amount of speed behind it, perfect for walks and days out. With a healthy radio signal that operates on its own frequency and with a range up to 300 feet, this construction toy can also be operated along with other pieces of your construction collection, as well as other RC vehicles at the same time, including cars, bikes and trains. Like other models discussed, this toy also comes equipped with flashing LED lights and an array of sound effects for engaging and exciting play. Power – There’s nothing worse than a remote control toy that has batteries that drain in next to no time. Therefore, ensure you check exactly how long their battery life is, how many batteries are required and if they are rechargeable or not. 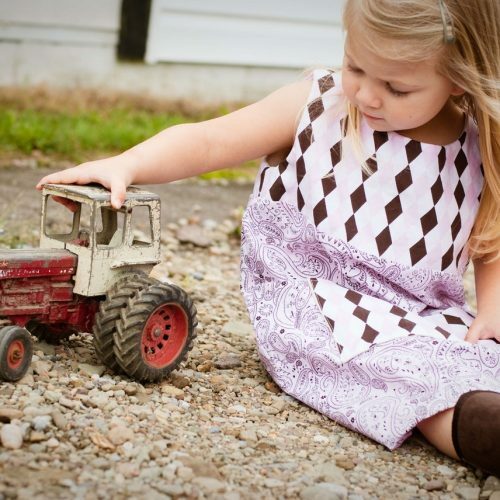 Durability – The chances are that your kid will want to ride the tractor in a variety of different environments, including indoors and outdoors. Therefore, ensure you select a tractor that is capable of driving over a range of different surfaces, grasslands, sand, dirt, and carpets. A tractor that struggles to make the journey isn’t going to win the attention of many children. Controller range – One thing many parents overlook is the range at which the remote control can work. It’s important to be aware how near you have to be to the tractor for it to operate and whether the signal is impacted by walls and other barriers. You will find that the better models available have a stronger signal, while those on the lower end of the scale have a weaker signal that is perhaps more appropriate for young kids that need more parental supervision. We believe that the Fistone RC truck is the best remote control tractor on offer for the price point and age range it targets (those above 5 years old). The alloy construction is very durable and bound to last a long time with proper care and play. In addition, the fact that it hosts its own radio frequency means that siblings and friends can play along using other RC vehicles at the same time, helping to promote teamwork, cooperation and of course – a fun time for all!